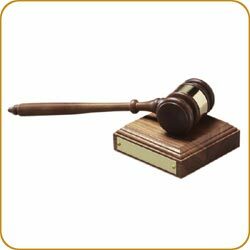 Removable Walnut gavel with brass engraving band. Click on image to see larger picture. 2019 *Denotes in-stock plaque part of our Speedy Delivery Program. Prices do not include engraving. Please refer to imprint info page. 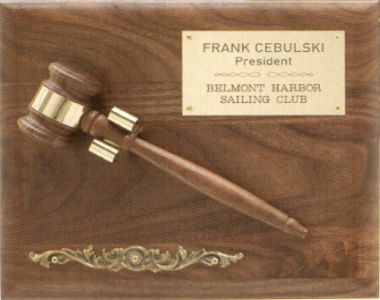 Non-removeable, gold electro-plated gavel mounted against black velveteen background inside a solid walnut frame, along with black brass engraving plate. Matching brass plate fits about 5 lines of engraving. Click on image to see larger picture. 2013 Prices do not include engraving. Please refer to imprint info page. The meeting can now come to order! Click on image to see larger picture. 2019 Prices do not include engraving. Please refer to imprint info page. 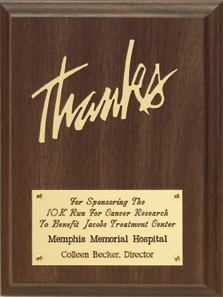 "Thanks" lettering cut out of faux-brass clearly relays your message. Brass plate fits about 5 lines of engraving. 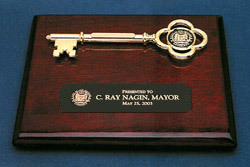 Solid walnut plaque, black brass engraving plate and heavy die-cast key. Optional plate on shaft of key or disc on head of key. Click on image to see larger picture. 2018 Prices do not include engraving. Please refer to imprint info page. Click on image to see larger picture. 2018 Prices do not include engraving. Please refer to imprint info page. 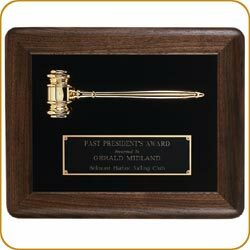 Solid walnut plaque, black brass engraving plate and heavy die-cast shovel. Click on image to see larger picture. 2018 Prices do not include engraving. Please refer to imprint info page. 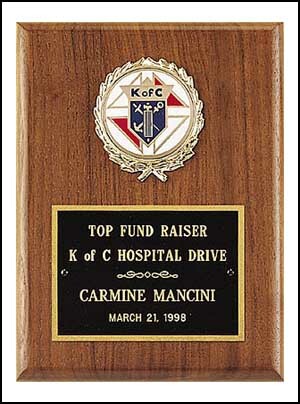 This cherry-finish plaque comes with pre-printed title and basic copy (click on plaque to enlarge). 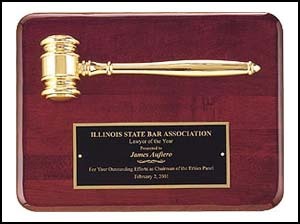 We can engrave whatever additional copy you need. See the Engraving Page for engraving prices. Click on image to see larger picture. 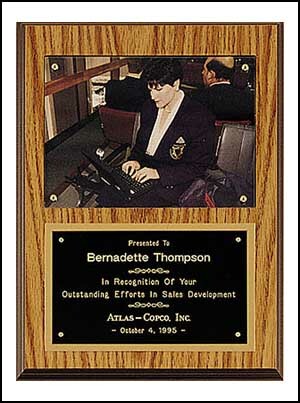 2015 *Denotes in-stock plaque part of our Speedy Delivery Program. Prices do not include engraving. Please refer to imprint info page. Click here for a list of discs available. Click on image to see larger picture in new window. 2019 Prices do not include engraving. Please refer to imprint info page. Choice of 7X (metal) plaque casting. 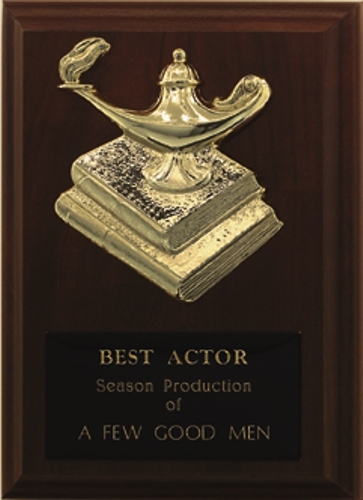 (See below) Please refer to imprint info page for additional engraving information. 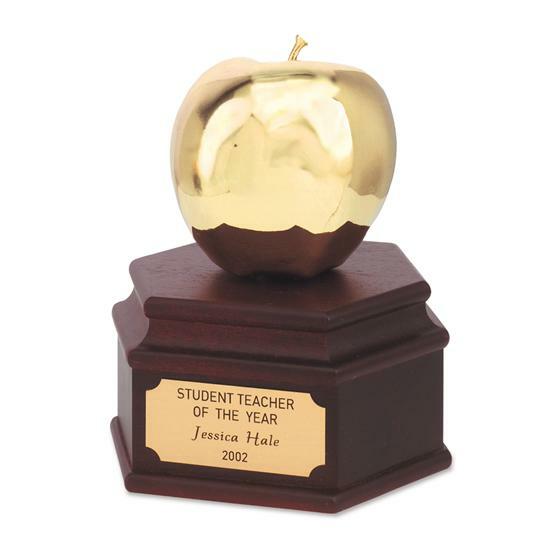 Get on your Teacher's good side with this golden delicious trophy! Stellar figures rise prominently above black marble base. Let your picture tell the story! Photo mounted in recess behind an acrylic cover. 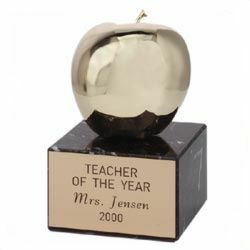 Great for team photos, teacher of the year, dog club awards, product design awards and much, much more! Can be displayed vertically or horizontally. 15 of the most popular mascots coast-to-coast. Designed with an elegant gold and pewter ribbon surrounding a most realistic representation of the icon. 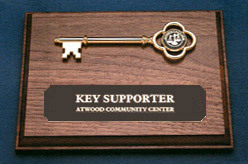 Click on the thumbnail(s) at right to view pdf file of these great little school spirit awards. 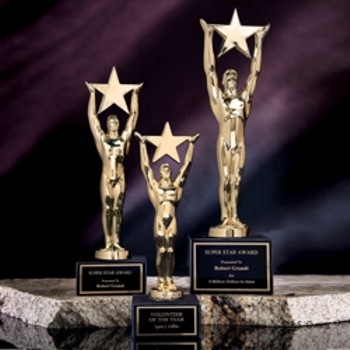 SIGNATURE SERIES™ GOLD STAR RESIN AWARD. Engraving plate included. 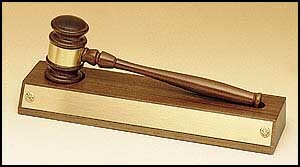 Copyright © 2006 Classic Design Awards, Inc.. All rights reserved.